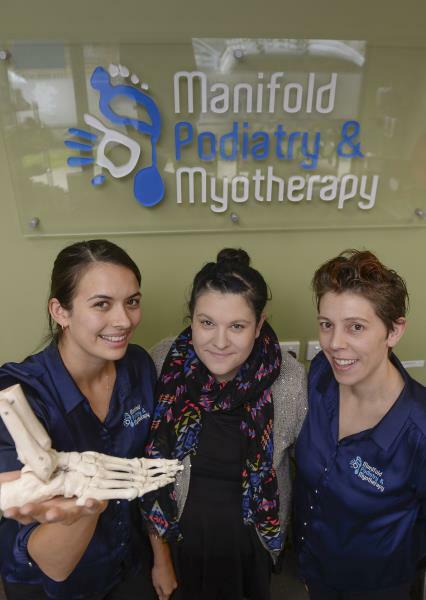 Manifold Podiatry & Myotherapy's Jennifer Hassett, Annie Horvath and Simone Leembruggen. PREVENTION rather than cure is much more than just a slogan at Manifold Podiatry & Myotherpay. Dr Simone Leembruggen says the clinic seeks out the cause of any foot-related problems rather than just treating the symptom. “When people come in we look at the whole person and look at the cause of an issue, looking at why the problem has arisen,” Dr Leembruggen explains. “Then we look at how to prevent it, to enable people to keep doing the things they love doing for as long as they can. Dr Leembruggen says education and empowering people to look after feet and prevent problems is the key. “We talk to clients about understanding what a good shoe is, how to fit shoes properly to make sure people are wearing the right shoes. Dr Leembruggen says that if clients return with a similar problem the underlying cause has not been resolved. Manifold Podiatry and Myotherapy also offers a revolutionary, safe and effective treatment for fungal nails. “The sooner we can treat fungal nails, the better the success rate. If people wait until the fungal infection worsens, it is a lot harder to treat,” Dr Leembruggen says. Manifold Podiatry & Myotherapy is at 2/84 Shannon Ave, Geelong West, phone 5298 2746.